Critical Viewing: Design What details in the artwork remind you of details in the poem? 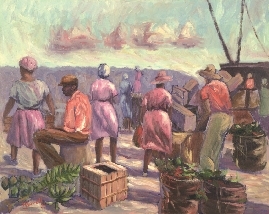 The Marketplace, 1988, Carlton Murrell. Oil on canvas, private collection. 5 To place within the growing seed. They bred, and dug and reaped. To feed the hungry Town. 1. Inference Do the farmers in the poem care about the food they grow? How do you know? 2. Mood What is the feeling at the end of the poem?